I am doing an experiment in which I am growing S. mutans in agar dishes, and I am not sure how I would measure the growth of the S. mutans. I am also not sure if I would do this by measuring cell mass or by cell count. Any ideas? The most simple way is seeding the plates with a suspension of bacteria ensuring that you spread the solution properly. 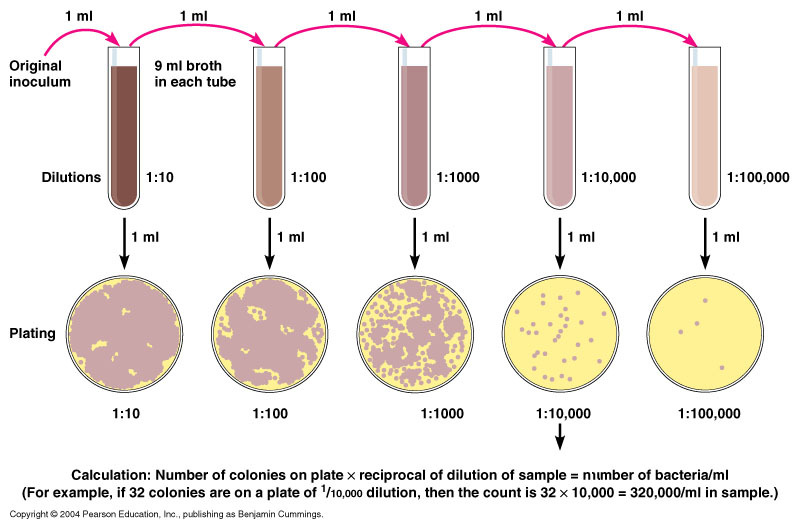 Then you can count the number of colonies, wich would be equal to the number of single cells. If you want to mesure the growth speed, usually it's simpler to just measure the diameter of the colonies, always ensuring you inoculate the plates with the same amount of inoculum. Lastly, it's even easier to estimate the growth if your culture is un liquid media and you measure the optic density with an spectophotometer. you will almost certainly want to perform serial dilutions of your suspension, and plate the serial dilutions using the spread plate method (or pour plate method). The dilutions will make it much easier to count the number of bacteria. Alternatives to CFU plating for measuring number of viable cells? How to measure surface area of plated bacteria?